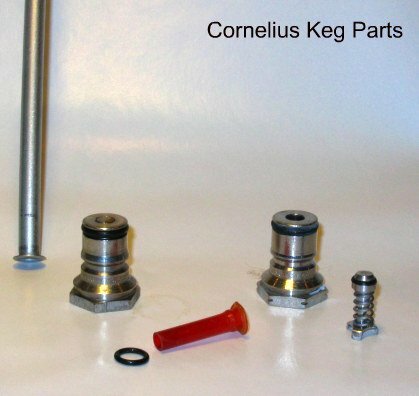 Cornelius kegs have been used for many years in the soda industry and since the soda industry has been dominated by two players there are two types of Cornelius keg valves for Cornelius kegs. The "ball" lock system (Pepsi) and the "pin" lock system (Coke). The operation of the valves is virtually identical. It's the method of attachment of the hose to the valves that makes them different. The difference is in the name of each system. As the names imply the "pin" lock system uses short extruded pins on the valve body to attach the disconnect. Conversely, the "ball" lock system uses metal ball bearing in a spring loaded housing to attach the disconnect to the valve body via a groove. Since the ball lock system is slightly more complex, I will desribe its inner workings. As I mentioned, the "in" and "out" valves are screwed down on an extruded, threaded post on the body/vessel with an opening through which the stainless steel dip tubes and their “O” rings are mounted. Inside of the valves, the working part is a spring-loaded “poppet” that engages or opens the valve when the appropriate Quick Disconnect or "Ball" Lock is snapped into place. For convenience and safety the “In” and the “Out” body connects have collars or lips that are slightly different in diameter and depth so that the gas side will only accept the gas ball lock and the liquid will only accept the liquid ball lock. Note: The terms “ball lock” and “quick disconnect” are interchangeable within the confines of this description. You will often find them identified as one or the other in most catalogs and suppliers. That leads us to the ball locks or quick disconnects themselves, which are colored gray for gas and black for liquid. Thereby, assuming that the gas and liquid (beer) lines are assembled properly, keeping you from trying to pull liquid from the top of the keg or pushing gas into the bottom of the keg. 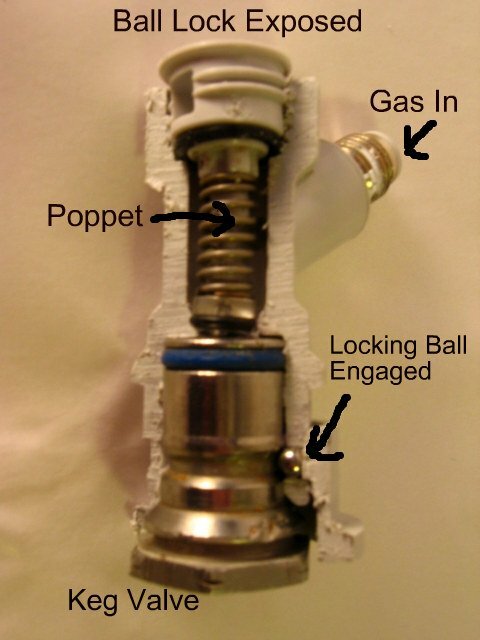 Inside each ball lock is another poppet valve that closes off the flow of liquid when the ball lock is released from the body connect. The spring tension between the poppet of the keg valve and the poppet of the ball lock are balanced so that when they are opposed or connected they open so that liquid or gas can flow and when released, the springs force the valves to close. The ball locks or quick disconnects are “locked” onto their respective body connects by four metal balls that are mounted in the lower portion of the device’s shank in a manner that allows them to move in and out horizontally. Hence the name “ball lock.” The quick connect portion of the device consists of a spring loaded collar that surrounds the four metal balls and keeps them “locked” inward so that they grab onto the grove on the body connect. When the collar is lifted, the metal balls can then move out. This allows them to slip over the lip or collar of the body connect so that the valve inside can be engaged or disengaged. The spring mechanism in the collar of the quick disconnect allows you to simply snap the device into place on the body connect. This can be done very quickly so that liquid or gas does not escape during the on/off activity. The ball lock or quick disconnect can be disassembled for cleaning. The words “IN” or “OUT” are generally stamped into the top of the plastic protector on the appropriate side of the keg. The “O” rings on the valve bodies are also often differently colored. Black usually means the liquid side and red or another color the gas side. When you are replacing the “O” rings try to find an alternative color for the gas-in side. For dispensing the set-up is simple, just attach a black ball lock to the beer line and a gray ball lock to the gas line then attach each ball lock to its appropriate valve and beer will flow from the liquid side. Now assuming that the gas pressure is acceptable and that the beer line is long enough and has an appropriate dispense mechanism, you will be able to pour a perfect pint of home brew.